Sandi Cramer had never seen so many glamorous people in one place before. She couldn't believe the size or the brightness of the spotlights lighting up the high clouds over the theater. Spectators lined the street beyond the barricade trying to see who was getting out of the line of limos pulling up to the curb. She couldn't begin to count the sequins and precious jewels on the women, and even the men, all around her. She slowly walked up the red carpet, keeping several feet between her and the couple entering ahead of her. She felt the urge to wipe her damp palms on the sides of her dress, but she didn't dare. The floor length creation that she wore cost more than ten of the fanciest dresses she had ever owned before. And it hadn't been easy to find. There aren't many such extravagant dresses made for women who are seven months pregnant. Most of all, she still couldn’t believe that she actually belonged here. 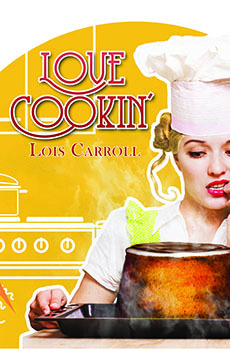 Her television show, Love Cookin', had been nominated for an Emmy. When she began her first cooking show at her uncle's little television station in Iowa fifteen years ago, she never dreamed it would catapult her to such a success. She was just doing what she loved doing. Pausing when a reporter stuck a microphone in her face, Sandi knew to smile as the bright lights were aimed in her direction. “Miss Cramer, you look gorgeous,” the woman told her. Sandi smiled and wondered if the camera on her would pick up the fact that her lower lip was trembling. She was an old hand at being on camera, so she shouldn't feel nervous, but she did tonight. “Thank you so much,” she replied, keeping the smile. Sandi didn't even get a chance to thank her before the portable lights were off her and on someone coming up the stairs behind her. Relieved, she quickened her step just a bit. Once inside the huge foyer, she looked for the ladies' room, something she seemed to have to find every five minutes lately. She didn't remember that with her first pregnancy, but that was ten years ago. Their son Bruce surprised them less than a year after they were married. She smiled thinking of all the cards and letters her viewers had sent. This little imp was a surprise they were very happy about. Coming back out into the crush several minutes later, she wished she had kept a paper towel with her to wipe her damp palms on. She laughed to herself just thinking how that would look. One of the short aprons she always wore on camera would sure come in handy. Running into a few people she knew as she headed for her aisle helped dissolve her nervousness a bit. She had met them at various points in her career in television. Tonight, they were all just interested in who would win the Emmys. Because she was nominated for one, they all wished her well. As she walked down the aisle to find her seat, she didn't see any of the celebrities whose shows were also nominated in her category, but that was fine by her. She'd only ever met two of them—both of them men. A young man in a tuxedo showed her to her seat. He hadn't known who she was, and she had to show him her invitation to get in. A humbling experience for some, she imagined. She was glad that she had put it in her beaded purse. He smiled an apology for not recognizing her, but she didn't imagine he watched a lot of cooking shows. She thanked him and slid into the red velvet seat, luxuriating in the simple comfort that sitting down gave her nowadays as her daughter grew larger and heavier. Her seat was in the side section, and she was surprised, but pleased that it was only second from the aisle. The seat next to her remained empty, as she knew it would, as the row filled up beyond her. She rose to let another couple pass her more easily. Looking around as they sidestepped past her was like thumbing through a Who's Who in Television book. Because her work since leaving Iowa had always been in public television or The Food Channel, she hadn't met many of them personally. As people stopped in the aisle by her seat and greeted her though, she was pleasantly surprised that so many knew who she was. Sandi smiled, but she still had a hard time believing that her lifelong dreams of a successful career in television had become reality. In the television studio, she worked alone with the cameras aimed at her and the counter before her or the cooktop at the end. She could totally ignore the people checking the props, adjusting the lighting, and even the ones who wanted to powder her nose or fuss over her hair. All that attention was fun, but it hadn't been like that for very long. When she'd first moved from Iowa to Chicago to work at the bigger station, she'd had a live audience in the studio watching her every move. That was a long time ago, but she remembered that having to entertain real live people took some getting used to. It sure wasn't like when she started in television back in the mid-1990s. Back then she was a new graduate from college working for her uncle who owned the local television station, KANT. The towers didn't send a very strong signal, so few saw her show beyond her own town. That little town in Iowa where it all had begun was a long way away from where she was tonight, but she'd loved it there. That's where she met her husband. Thinking how close he came to firing her took her breath away. She wished her uncle and her aunt, who had been so supportive of her early efforts on the tube, could be sitting beside her for the Emmys, but they had died within months of each other about five years ago. They had gotten to know her son, but the sweetie she was carrying now would never know their kindness and love. The back of her eyes stung with tears of regret. “Not going to happen,” she warned herself sternly as she pulled a lacy handkerchief from her purse and dabbed the moisture from the corners of her eyes in a way she was certain wouldn't mess her makeup. She wished that her husband were there next to her. But he would be soon. He promised that he would be sitting there before her category came up. He had been so supportive and encouraging since, well, almost from the beginning—that is except for when he said he would fire her. She smiled because meeting him for the first time had almost heralded the end of any association she would have with television other than watching it in her living room. Those weeks had almost heralded the end of KANT, the Iowa television station for which she had worked so hard.